This post has been compensated by Mirum and its advertiser. All opinions are mine alone. 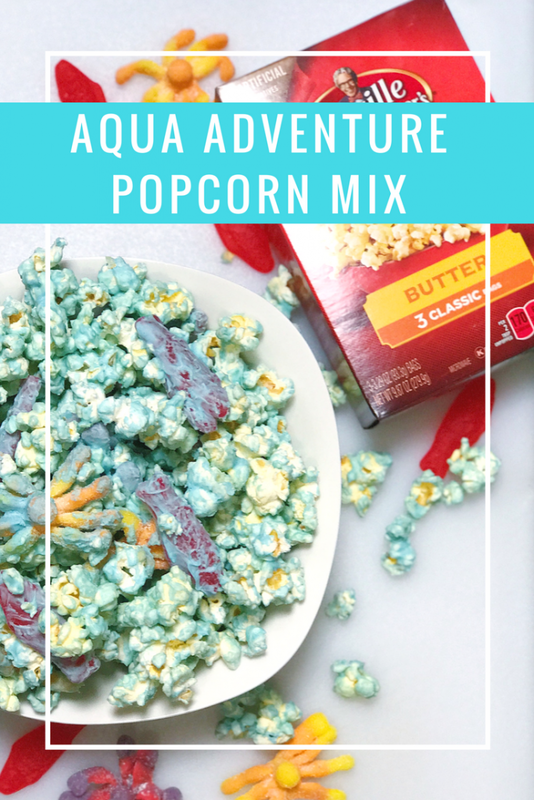 The Aqua Adventure Popcorn mix is a nice blend of salty and sweet; plus the added aqua color will catch the attention of both kids and adults alike. It takes only about 30 minutes to make and under 10 minutes to devour! Have you seen the previews of the upcoming ‘JUSTICE LEAGUE’ movie? It’s landing in theaters on November 17, 2017 and you can bet my family and I will be there on opening day. I’ve always been a fan of the Superman movies. It’s almost like I can relate a little to his secret identity; Clark Kent by day…Superman by night. When my kids were little, I was mom by day and blogger by night. See? Superman and I are the same. Ha! The latest JUSTICE LEAGUE character movie I saw was, you guessed it, WONDER WOMAN. My daughter saw it before me and she said it was an absolute must see. And boy was she right! The movie was done so well on so many levels. The casting was perfection. The story line kept my attention. It was a movie the entire family enjoyed. I’ll be honest, when it comes to the JUSTICE LEAGUE characters I wasn’t 100% familiar with all of them. Then I saw the movie previews and started doing a little research into who they were and what powers they held. I wanted to create a fun popcorn mix based on one of these characters in celebration of the movie. I was familiar with Superman, Batman, The Flash and Wonder Woman; but not so much Aquaman and Cyborg. What better way to celebrate this upcoming movie than with popcorn and some candy, right? Popcorn, candy, and movies go hand in hand. Needless to say, my family was pretty excited about this popcorn creation based off of…you guessed it, Aquaman! This recipe is so easy and delicious. If you love a mix of salty and sweet, you’ll really like this. I used a bag of Orville Redenbacher’s Classic Bag Butter Popcorn. You can pick it up at your local Kroger Co. banner and save while you’re there! Now through December 3rd, you can save $0.50/1 on 2-3ct Orville Redenbacher’s only, while supplies last. Look for the coupon in the Snacks section of the digital coupon site. Alright, here’s how to make the Aqua Adventure Popcorn Mix in celebration of Aquaman and JUSTICE LEAGUE! Pop one bag of Orville Redenbacher’s Classic Bag Butter Popcorn. Pour it into a bowl and let it cool. After it cools, be sure to pick out any of the leftover kernels. This is so you don’t break a tooth while munching on it. 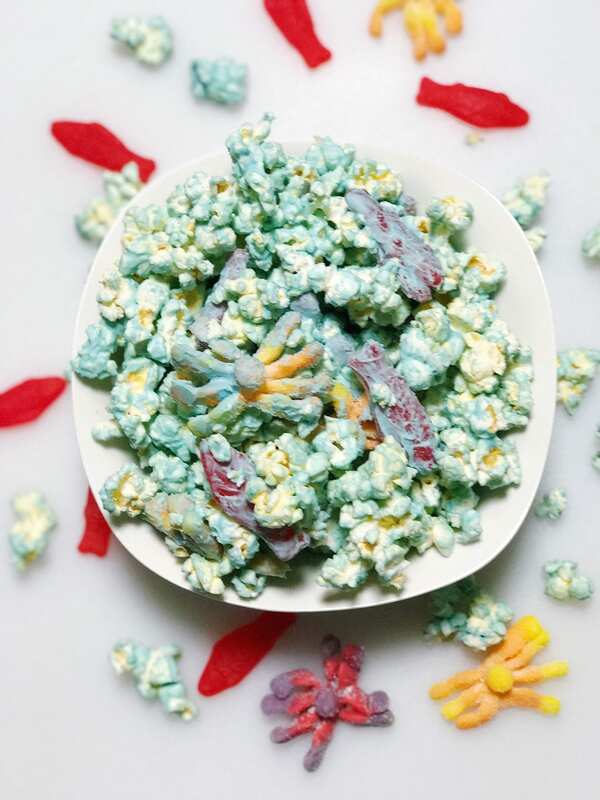 After the popcorn has cooled, add any kind of marine life candy or gummies you want. I added a few of the sour octopi and ½ a cup of fish to the mix. If you want, you can also add ½ cup of peanuts to the mixture. Melt ½ a container of white almond bark according to package directions. (I use the chocolate almond bark for my Chocolate Peanut Butter Balls every year and the white for seasonal popcorn mixes.) You’ll find it in the baking section of your grocery store close to the chocolate chips. Now comes the fun part! Add a few drops of blue food coloring to the melted almond bark candy coating. 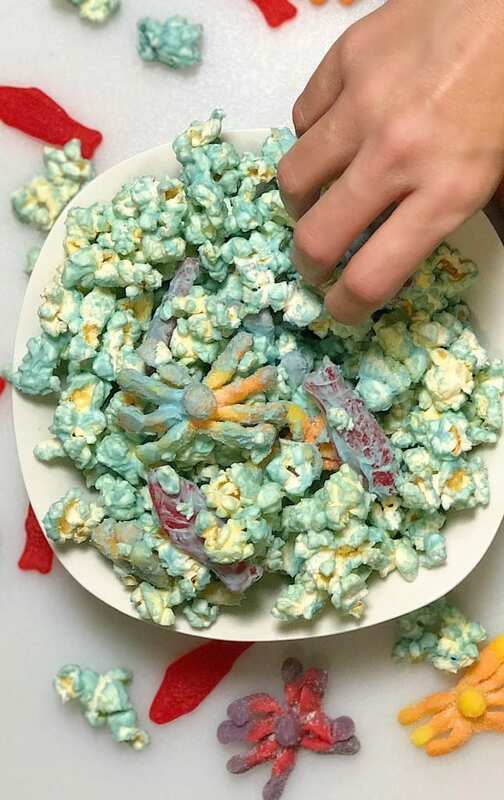 This will turn the popcorn blue and make it one really fun snack to enjoy. Pour the melted candy coating over the popcorn mixture and mix until everything is well coated. Spread the mixture on a baking sheet lined with wax paper and let it harden. This should take about 30 minutes. After it has hardened, break it up into chunks and serve! And that’s it! 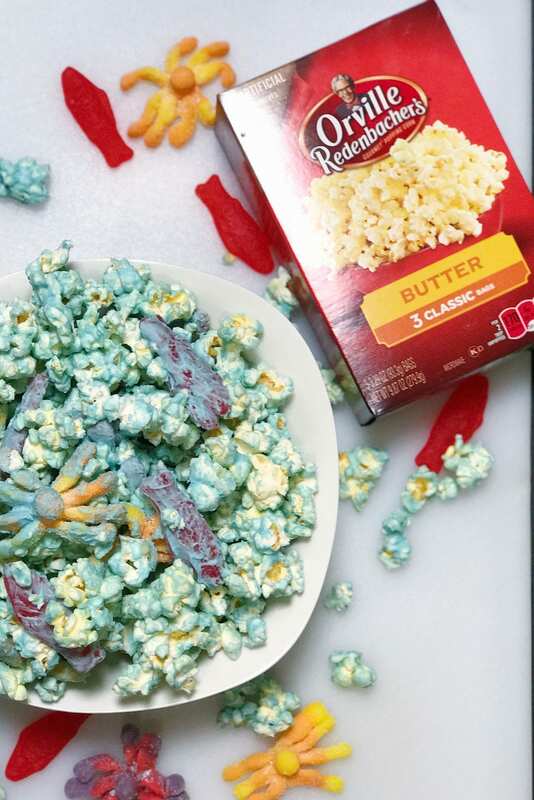 Your family will devour this Aqua Adventure Popcorn mix. • Pin my recipe to your Pinterest board, or find your favorite here. • Include the hashtags #orvillepopcornjusticesweepstakes in your pin description. • Log in to the sweepstakes widget using your Pinterest account and finish entering. Check out other ways to enter. • You can enter once per day per method. Warner Bros. Entertainment Inc. and its parents, affiliates, and subsidiaries are not responsible for the promotion, administration or execution of this Sweepstakes. Enjoy another yummy popcorn recipe called Gotham Goodies. Good luck! Enjoy the movie!